Science museums are always great places for a teambuilding scavenger hunt. You can run around and touch everything in a way that would not fly at, say, the Museum of Modern Art. 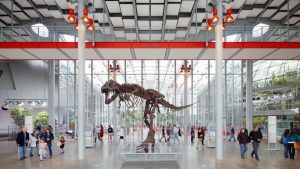 At the California Academy of Sciences, you have a lovely setting in the heart of Golden Gate Park, and a state-of-the art museum/aquarium/planetarium. In short, you can be a kid here, while enjoying the cool glass architecture and the sculptures outside. Just a really fun place to unwind and solve our trickiest puzzles. Location Description: With its state-of-the-art aquarium and planetarium, its natural history museum, 4-story rainforest, 3D theater, two restaurants, and roof terrace, the Academy takes its place among the greatest natural history museums in the world. An ideal hunt location for those cold, foggy and rainy days in the City (both winter AND summer), this is a great place for a corporate teambuiding activity. Museum History: From the humblest of origins — a dark evening in 1853 when seven men assembled in a candle-lit room to found the first scientific academy west of the Atlantic seaboard — the California Academy of Sciences has grown to become one of San Francisco’s most popular destinations. Not that it hasn’t taken its hits over the years! After the Great Quake of 1906 struck the city, the museum and all but a handful of specimens were lost. Then, in 1989, nature again took its toll in the form of the Loma Prieta earthquake. Major structural damage left the Academy in need of another beginning. The Academy’s newest home, nearly 10 years and $500 million dollars in the making, opened on September 27, 2008 to near universal acclaim. During your corporate teambuilding treasure hunt… you’ll see it all, from downstairs aquarium to rooftop solar panels. Enjoy this unique way of experiencing one of San Francisco’s hottest attraction.